Here are some useful other resources about Swine Flu…..
2. Need to keep up to date with the latest developments? 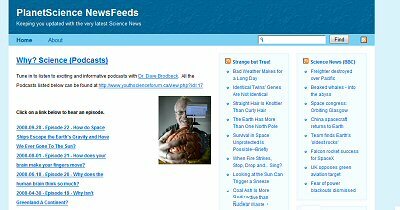 Looking to bring the latest Science News and useful Podcasts into the classroom? Our latest development saves you time searching! A whole set of science Newsfeeds has bee provided for you at www.planetscience.org/news . Updated everyday……to keep you informed about the latest developments…. Category: Announcements | Comments Off on Science in the News! Hot Potatoes is a powerful resource for producing a range of interactive activities. All you need to do is enter the data for your exercises (questions, answers, responses etc. ), and press a button. The program will create the Web pages for you, if needed. They can then be uploaded them to one of our websites. Alternatively, you can PRINT paper versions of your exercises. The choice is yours. You can include your own images, or images from our Image Galleriers, such as www.webucate.org . This will eliminate any problems with copyright issues. Hot Potatoes is free for use by state educational institutions which are non-profit making, on the condition that the material produced using the program is freely available to anyone via the WWW. Interactive Revision (24/7 Access) Here is a number of quick starters/plenaries, or whatever you need to use them for (AfL) . Complete Zip Packages (B1a1 and B1a2)…includes web versions and Hot Potatoes versions. Guidance for choosing the GCSE course for Year 11 can be found on our Online Handbook! Mr. Windeatt has found a very useful website for Sports Science.